A blank day! Whoever heard of a day that was not part of a week? But that?s exactly what Moses B. Cotsworth wanted. Calendar Reform was his passion. He took his proposal clear to the League of Nations ? the highest international organization in the world. Captains of business and industry, along with politicians, diplomats, and social activists, jumped on the Cotsworth bandwagon. The League of Nations agreed that the world needed ?a more uniform and more rational measurement of time.? Proposals had poured in from the international community ? nearly 200 of them. Cotsworth?s was the obvious favorite. But his calendar scheme had a fatal flaw. Jews and Seventh-day Adventists spotted it immediately. Cotsworth?s annual blank day would interrupt the continuous rhythm of the seven-day week. Sabbath keepers would be faced with two untenable options: adapt their weekly worship cycle to the new calendar or live their lives continuously out of sync with the world around them. The latter choice would be disastrous for their businesses, employment, and the education of their children. Sunday-keeping Christians would face the same problems. The arguments, pro and con, flew back and forth in the press. Business vs. religion. Social progress vs. personal freedom. International unity vs. minority rights. The crescendo of disagreement culminated in a confrontation at the League of Nations headquarters in 1931. 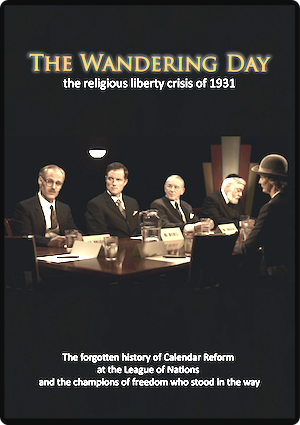 An instructive piece of history, The Wandering Day acquaints you with the characters on both sides of the issue. It highlights the challenge to the principles of religious liberty and reveals the divine workings that prevented what would have been a disastrous interruption in sacred time ? an interruption that would have made criminals of law-abiding citizens and forced people of faith to choose between conscience and survival. After all, what business would hire a man with a wandering Sabbath? This documentary was made possible by a grant from the Winifred L. Stevens Foundation. Research access was provided by the George Eastman House and the Office of Archives, Statistics, and Research of the Seventh-day Adventist Church.